The Indicators of Resilience in Socio-Ecological Production Landscapes and Seascapes (SEPLS) is a collaborative activity, initiated in 2011, between Bioversity International and the United Nations University Institute for the Advanced Study of Sustainability (UNU-IAS) under the International Partnership for the Satoyama Initiative (IPSI). The resilience indicators are a way to assess the current status of the use and management of biodiversity in production landscapes and seascapes, and to support communities in continuing to maintain and scale up biodiversity in productive and biodiversity rich landscapes. Since 2013, UNDP and IGES have also been involved in the project, with all parties working together to develop a toolkit for application of the indicators in the field. A workshop was held at Bioversity International headquarters in Rome from 29 to 31 January 2014 with the purposes of: reviewing the first draft set of indicators based on field testing carried out by Bioversity International and UNDP; and beginning the process of creating a toolkit for practitioners to use while implementing the indicators in the field. UNU’s Kaoru Ichikawa speaks to a full house at the seminar. The first day of the workshop consisted of an opening ceremony and seminars by a number of interested parties. After a brief explanation of the indicators project by Pablo Eyzaguirre of Bioversity International, opening remarks were given by Ann Tutwiler, Director General of Bioversity International, who stressed the importance of the indicators approach in various conservation-related fields. Next, Kaoru Ichikawa from UNU-IAS gave an overview of the indicator approach in understanding resilience of SEPLS. Diana Salvemini, COMDEKS Project Manager at UNDP, then spoke about lessons learned from testing of the indicators and a community-based landscape approach to resilience. Nadia Bergamini from Bioversity International presented results of field testing the indicators in various countries, followed by Ikuko Matsumoto from the Institute for Global Environmental Strategies (IGES), who talked about the development of the toolkit. This was followed by a brief presentation by Corinna Del Bianco of the Romualdo Del Bianco Foundation’s Life Beyond Tourism, which will serve as the host for IPSI’s European Regional Workshop in Florence in May 2014. Finally, Dr. Parviz Koohafkan from Bioversity International gave a presentation on the importance of agrobiodiversity for sustainable development, followed by a short question-and-answer session. 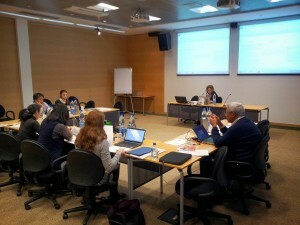 The second and third days were taken up by intensive discussions among the members of the team working on developing the Indicators Toolkit. The discussions were very productive under the leadership of Dr. Pablo Eyzaguirre of Bioversity International. It is planned that the toolkit will be launched during the 5th IPSI Global Conference (IPSI-5) and CBD COP12 in October 2014. This event was an excellent opportunity to connect with a large number of people working in indicators and landscapes, and to engage in very productive discussion. The workshop was very successful due to the active participation of the members and generosity of the host, Bioversity International.